I depart on my Vietnam and Camodia experience on the AMAWaterways AmaLotus in just a few days and the whole family is getting pretty excited. I was going to write about the specifics of our trip here, but I got side-tracked...in a good way. It is also easy to organize some more appropriate clothing for your 16 year old (read: Go to a discount store and purchase the tennis shirts and shorts he would never be caught dead in at home so that is he presentable on the ship, doesn't offend any Vietnamese or Cambodians with the messages on his "normal" t-shirts). This is a regular pre-travel event for us so there is no drama. Of course as I do this I also re-dye the underside of my daughter's hair purple...and have to admit it looks pretty darn good; and subtle enough that it may turn heads, but not stomachs. It was a piece of cake to invest $100 for 30+ teenager-friendly discount DVDs for the 48 hours of travel (there and back) and the evenings in the hotels and on the ship (knowing that the ship's collection is most certainly more slanted towards an older crowd) and anticipating the ship will not have many (if any) kids. Chick flicks, really bad horror movies, action movies, comedies, etc. The bins at Walmart and Costco are great for this. And, as another little travel tip: The Therm-a-Rest Travel Cushion is a great investment. It is a collapsible and adjustable air cushion you can use on your seat or on your lumbar region. I find that by adjusting the air content and moving it around over long flights my bottom and my back are much happier. What is interesting is that me, my wife, my 13 year old daughter and my 16 year old son each have truly different expectations of this trip, Vietnam and Cambodia. I guess being the "old guy" and very much aware of the protests concerning the Vietnam War and also the Khmer Rouge genocide this trip has multiple levels of interest....beyond the beautiful scenery and different cultures. But I digressed: Now I could have turned to a long lecture with those glassed-over eyes that teenagers get, or I could have plunked her down in front of the television and put on a documentary (or even the movie, Platoon) while playing Crosby, Stills & Nash protest songs in the background concluding, "That's what the war was about." But I had a better idea! 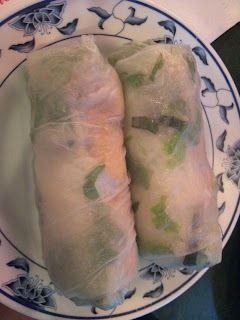 I found a tiny, hole-in-the-wall, Vietnamese restaurant in Edison, New Jersey called Pho Anh Dao. The restaurant is in a tiny strip mall in between a piano store and a Dunkin' Donuts adorned with florescent lights and about 15 green and black Formica tables. Our table (the only open one) was next to a soda refrigerator. Letting my wife see the restaurant, I became fascinated with its content, but also noticed we were the only table that was not of Vietnamese descent; a good thing! Our waitress was Vietnamese, but came to the U.S. from an area just south of Saigon proper when she was a child, having returned only once. She was very friendly, patient and frenetic at the same time. Besides explaining the condiments and how to use them, she explained that we are to eat everything. The lettuce is not a garnish, but part of the meal. She strongly noted, "Nothing is wasted!". My wife orders Deep Fried Vietnamese Egg Rolls. Our waitress points out that is not Vietnamese, but is on the menu for Americans! She said they still are very good, especially when wrapped in the lettuce leaves and dipped in Fish Sauce. She was right. But from then on it was authentic Vietnamese all the way. 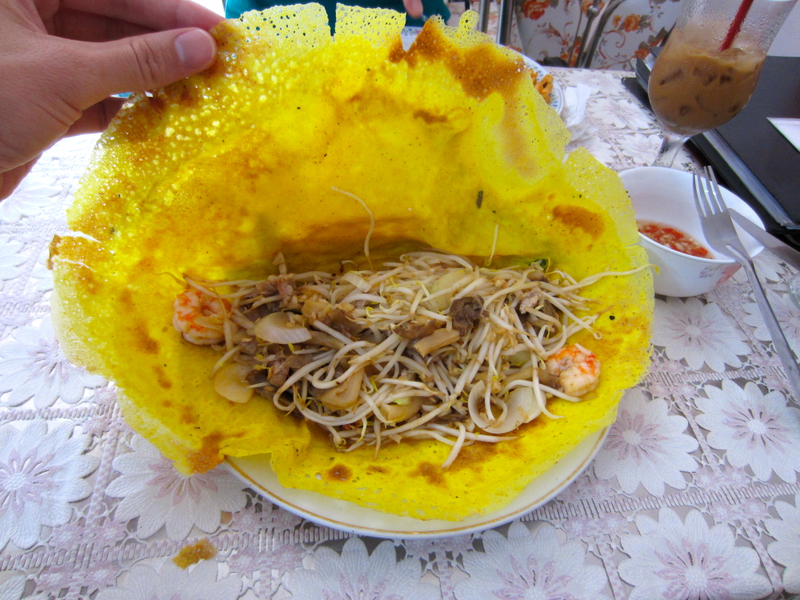 Vietnamese Pancake w. Shrimp. This was attacked so quickly that I didn't get a chance to photograph it! It is a golden brown crepe of sorts (French colonial influence! More cultural lessons.) filled with bean sprouts and . To that you open the crepe and add lettuce and mint. It had its own sort of Hoisin sauce, but my daughter was loving that Peanut Sauce so she added some. And then what I had come for. Something I never had, but had heard it was what Vietnamese cooking is know for. 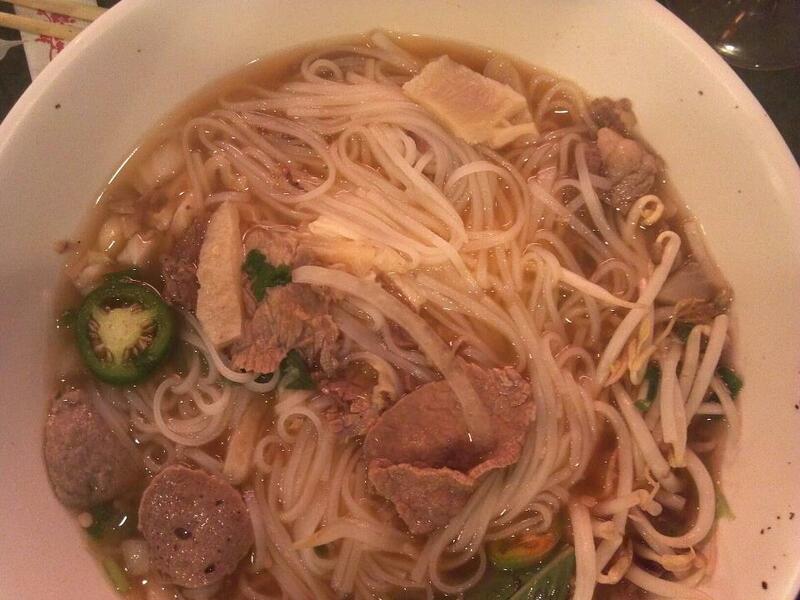 Pho (pronounced "Faa"). It is a rice noodle soup fill with other things. So I ask our waitress what is the most traditional Pho. She says it is not explained on the menu, but is simply called Pho Combination. Now I am getting very happy. She says it contains lots of things most Americans won't eat: tripe (stomach lining), tendon, and other things. You know I ordered that. This huge bowl arrives with all sorts of goodies, including very rare beef (still cooking in the hot soup), meat balls of some sort, noodles, and more. With this comes a plate containing bean sprouts, fresh basil and jalapeno chilies. I am told to put the dish's contents in the bowl along with, if I like, Sriracha Sauce (Vietnamese hot sauce). One word: Awesome! Now, what to drink with your Pho? I knew what I wanted: There is a Washington State Riesling called Kung Fu Girl that is a great paring, so I brought some with us. But for my daughter? Well, remember that soda refrigerator I was talking about? It was like being a kid looking through the glass at the candy counter wondering how I was going to spend my five cents. You check out this one and that one and then you weigh your options. 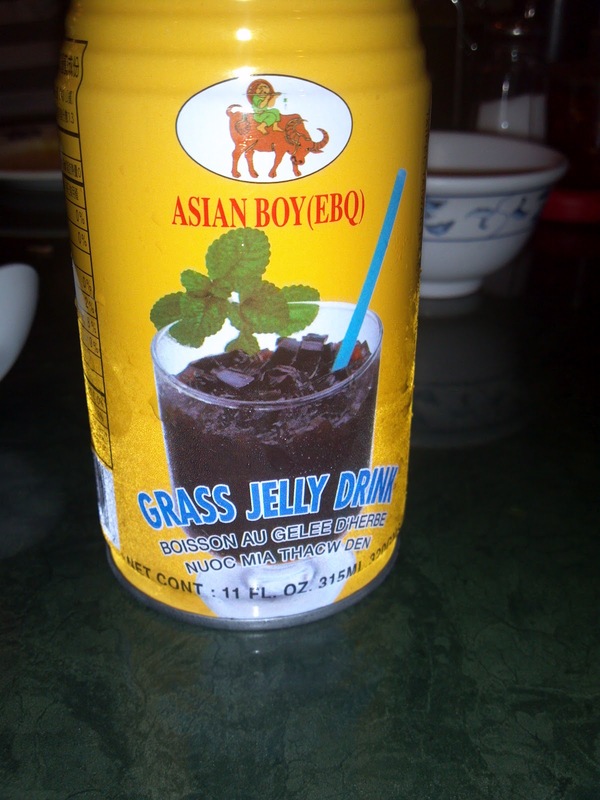 We decided to go with the most unusual one to us, but which our now beloved waitress says taste a bit like strong tea with lots of honey: Grass Jelly Drink. It tasted great, but the texture...chunks of a jelly like substance that tasted very good...was weirding my daughter out. Another lesson: Don't let the texture get to you. Five bucks says you can eat all the jelly! She did it. An interesting thing to consider: The can, if you look at it, is an "old fashioned" steel can with seams on the top, bottom and side of the can. It also weighs about three times that of the more modern aluminium cans we are used to. I have discovered it is part of the Vietnamese culture of recycling everything...and one thing that was plentiful post-war was metal. So if you keep recycling it, the equipment remains usable and the cycle continues. 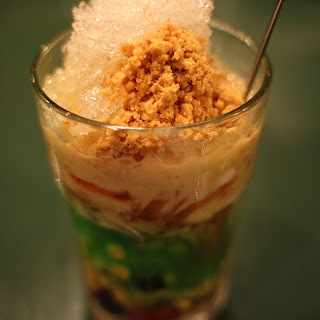 The photo is not the one my daughter had, which was actually far more attractive, but I figure you probably wouldn't have thought it came in a glass sort of like a milkshake! So now, having had a bit of a culture lesson, through food, about what the cuisine is like, not to be put off by texture, how nothing is wasted and the influence of French colonialism...all in a little hole-in-the-wall restaurant in Edison, New Jersey with a really friendly waitress and a soda refrigerator staring at you, we will do a just little bit more homework on the Vietnam War and the Khmer Rouge and we will be on our way. I promise the next article will be on the specifics of our trip!